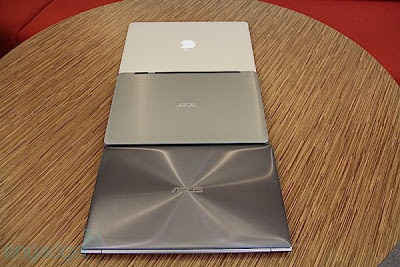 MacBook Air Vs Ultrabooks – Which is Better? The term ultrabook was first used by Intel for its ultraportable laptops with specific set of guidelines.These devices use either a cache of flash memory or a solid state drive to boot Windows quickly and have the thickness of less than 0.8 inches. A minimum of 5 hour of battery life is offered by these machines. Now, let’s find out the differences between MacBook Air and Ultrabooks. The screen quality of Apple’s MacBook Air is way better than that of other Ultrabooks found in the market. They are vibrant, bright and have got better viewing angles. This is the result of Apple’s total control over software and hardware. The glass trackpad on the MacBook Air is reliable, dead accurate and silky smooth, on the other hand many ultrabooks offer unreliable performance. Another good thing about Air is that you can perform various tasks with the help of the myriad multitouch gestures. We don’t find any of the ultrabooks’ keyboards as comfy as that of the Apple’s ultraportable. Moreover, the bright backlighting enables you to read the keys easily. We know that Apple’s OS is not totally immune to security threats, but I find OS X Lion simpler than the Windows 7 or 8. Features like Mission Control, the search token feature in mail, Auto Save and Resume, allow me to do my tasks easily. Additionally, Lion is stable than the Windows 7. The cost price of the 13-inch MacBook Air is $1,299, while you can get the Toshiba Portege Z835 Ultrabook with just $799. The weight of this ultrabook is just 2.4 pounds and it offers the battery life of 7 hours. Though the 128GB solid state drive and Core i3 processor are not as quick as the Air, you do get good performance for the price. There is no doubt that the 13-inches are the road winner. However, the choices of people differ from one to another. And there are choices for those people who want bigger screens. For instance, the HP Envy 14 Spectre comes with the scratch-resistant glass. On the other hand the 15-inch Samsung Series 9 has the 1600 x 900 resolution. Though we don’t find SD Card slots in some of the ultrabooks, many of them posses more ports in comparison to the Air. For instance, the HP Folio consist Ethernet, a full-size HDMI port and two USB 3.0 ports. There is even a VGA port in Portege Z835. Users often find the limited 128GB of storage of MacBook Air and some Ultrabooks quite less. However, there are certain ultrabooks like the Samsung Series 5 Ultra which has a hard drive of 500GB. The price of ultrabooks are relatively low than the MacBook Air, but they don’t offer same responsiveness and speed of the Air. The best thing would be to go for the one which meets your needs. Author Bio: Scott Garcia is a technology geek and loves to share his experience with others. Learn his views regarding medical nanobots.